Pure white light is actually comprised of seven different colors: red, orange, yellow, green, blue, indigo and purple. When beams of sunlight shine through any type of prism at just the right angle – including raindrops – these seven colors are separated out for us to see. Color differences are due to varying angles of light beams; these differences create all of the color frequencies we know and love. The total size and shape of a rainbow is a full circle of color. We only see it as a half-circle because of our location on the ground. Some people in airplanes have reported seeing full-circle rainbows. Full-size rainbows are formed in rain or a fine mist, but did you know that each and every individual drop of rain also creates a tiny rainbow in and of itself? When attempts at creating rainbows have been made indoors, it has been found that some sort of reflective surface is required such as a mirror or a sheet of glass. One wonders what the beautiful arced rainbows we see outdoors are reflecting upon? Is there some sort of firmament or atmospheric layer above us? Some people are lucky enough to have seen a double rainbow, but they can also occur in threes and fours. When this occurs, light is reflecting multiple times within raindrops. While extremely rare, it does happen. 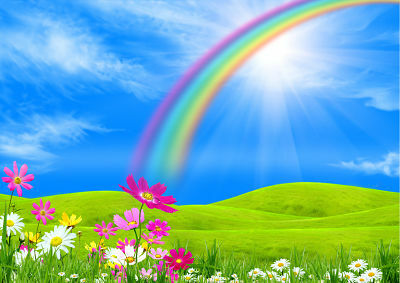 Most rainbows are seen in the morning or evening, with very few spotted around lunchtime (noon). This is because light must strike falling water at 42 degrees to create the colors of the rainbow, and this is typically not possible when the sun is so high in the sky. While a rainbow is created during the day by the sun’s light, a moonbow is created by moonlight. Moonbows appear as an arc in rainy or misty conditions just as rainbows do, but the colors are much fainter and can even be read as white. It’s hard to believe, but some cultures have seen the beautiful rainbow as a harbinger of doom. They have been associated with demons, violent storms and bad luck. Today there are far more positive associations with rainbows than negative, with most people seeing them as a sign of hope, rebirth and good things to come. Informal polling has determined that the U.S. state of Hawaii is home to the most rainbows of any area on earth. Honolulu has been dubbed “the rainbow capital of the world.” A rainbow is even featured prominently in the Hawaii auto license plate design. The abundance of rainbows here is due to frequent short mountain rain showers combined with lots of sunshine year-round. The rainbow has been the muse of poets, artists and songwriters for centuries. Its beautiful colors and mysterious properties are a source of hope and inspiration to just about everyone who sees them. Now you know just a little bit more about this striking natural phenomenon.